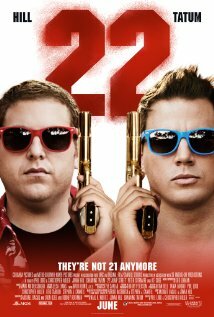 If you thought 21 Jump Street (2012) was funny, you’re probably going to enjoy its sequel. Jonah Hill and Channing Tatum have returned as police partners and all around best buddies Schmidt and Jenko and are up to the same hijinks. Phil Lord and Christopher Miller are back in the directors chair with a bigger budget and a similar plot as the characters will remind you several times during the film, and also returning are enough familiar faces (Ice Cube, Rob Riggle, Caroline Aaron) from the first picture. Sequels to comedies are not known for being very successful (Caddyshack II, Evan Almighty, Blues Brothers 2000 for crying out loud!). Luckily, 22 Jump Street was smart enough to take the action-comedy route and it feels more akin to Beverly Hills Cop II or a Lethal Weapon sequel. No, Hill and Tatum are not quite Gibson and Glover, but there is no denying their chemistry on-screen and it helps that the script is savagely self-aware without ever breaking the fourth wall like so many comedies do to take the easy way out. It also is helps that not only is the screenplay by Michael Bacall, Oren Uziel and Rodney Rothman very clever, but it’s also very undeniably funny. The plot is the same thing as 21 Jump Street except with a bigger budget and the main characters are going undercover at a college. The film even reminds us of that a few times during as the characters are talking. It also reminds us that we are watching a movie for fun and escapism without every being dumb or condescending to the audience. It treats its material as a sequel but unlike many big studio pictures, it was written and directed with a lot of TLC and respect for its ticket buying audience. Our two unlikely buddy cops are once again searching for a drug dealer who is selling a deadly new type of drug called “WhyPhy” (pronounces WiFi, even as a type that explanation I am smiling). They get involved in some shoot outs, spats with college students about their age and this film is notable for featuring 2 scenes that really impressed me. The first was a scene involving our heroes on a funny split screen acid trip off the new drug, which features some very character driven and artistic set pieces. The other scene was one of the most cognizant and satirical car chase scenes since Dirty Harry and the remote control car raced through the streets of San Francisco in The Dead Pool (1988). The performances were dead on and exactly what they needed to be for this film with nobody taking what they were doing too seriously but also none of the actors fell into parody. Our two leads were obviously the standouts and if either Mr. Hill (now a two time Academy Award nominee) or Channing “Magic Mike” Tatum faltered the whole film could have collapsed around them. Fortunately, they both knew exactly how to play and everything else fell into place around them. Ice Cube also delivers his shtick, but even though we have seen his scowl and heard his foul mouth hundred of times before, this time the script gives him material that makes his acting style seem refreshing. The scene where he is at a fancy buffet dinner with Jonah Hill and two other women is the best acting Ice Cube has done in years and those five minutes are funnier than the entire movie Ride Along (2014). The bottom line, it is worthwhile to stop by 22 Jump Street. The new address does not change much except a more expensive production value, but the laughs are still there. The plot is the same many of the characters are the same but do not be discouraged by the new number, unlike some comedy sequels, the humor moved to the new address with everything else.